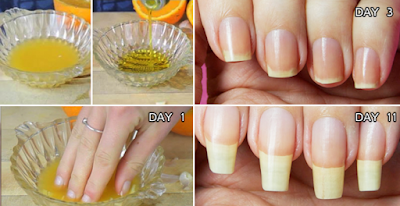 Home » Health Tips » How to Grow Your Nail Fast and Effectively? How to Grow Your Nail Fast and Effectively? Our nails contain a type of protein which is called keratin. Our toenails are the ones that usually develop faster than our fingernails. Numerous factors can contribute to slow nail growth like for example medicines, some hormonal changes, health problems of the lack of nutrients. In this article, we’ve decided to present you some natural remedies that can help you accelerate the growth of your nails! Garlic is considered to be one of the best known home remedies for accelerated nail growth. It protects our nails from any infection because it’s abundant in various antifungal and antibacterial properties. It makes our nails smooth and thick and contributes to their health as well as beauty. First, you should cut a garlic clove in half. Rub it gently on your fingers and make sure it stays like that for several minutes so it can be absorbed by your nails and skin. You can also mix several garlic cloves to create paste. Apply this paste on your nails for 5 minutes. The good results will appear very soon! Vitamin E is a compound we must have in order to have healthy hair and nails. It also stimulates their growth.Add some essential oils into some vitamin E. Mix everything.Heat the mixture just to warm it up.Use the mixture to dip your nails in it before you go to bed. Leave it to act throughout the night. In the morning, you’ll be stunned by the results! Open 2 or 3 vitamin capsules. Apply the contents on your nails. Put some manicure gloves over your hands and go to sleep. Take off the gloves in the morning and you’ll notice great difference. It would be the best to perform this procedure for 1 week in order to notice optimal results.